Each child should have glue, scissors and color/pencils. After the presentation of some of my originals artworks from books I illustrated, I am showing to the children my favourite technique to find ideas and begin a collage artwork. 1) Each child choose between many one cropped scrap paper piece on the photocopy sheet. The shape inspiring the idea of the artwork he will do. 2) The child paste the scrap paper piece on a sheet. 3) The child complete the artwork using other pieces of different papers, colour pencils and oil pastels. I bring photocopies with cropped scrap papers for all the children. It could be great also if teachers and children could take time before I come, to find and keep their own cropped scrap papers to complete their artwork. **My workshops are more about developing creativity instead of showing drawing techniques. Montreal native Manon Gauthier is a self- taught Children’s book illustrator and visual artist who studied graphic design and worked in that field for more than fifteen years. 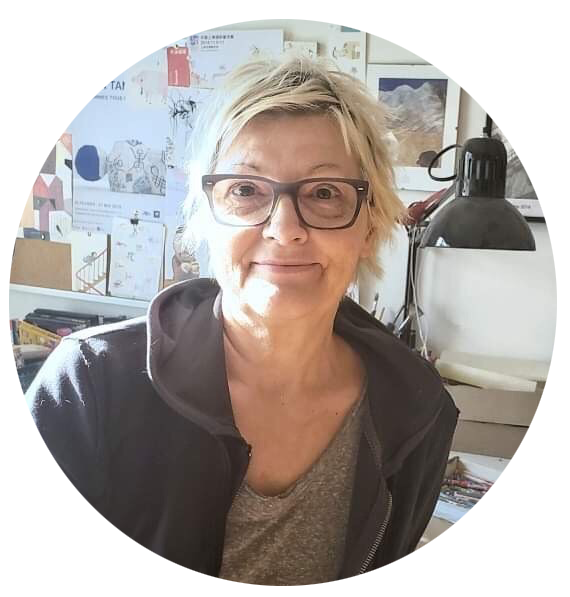 In 2007, after experiencing the joy of illustrating her first children’s book, she decided to devote herself to books for young people. Since then, Gauthier has illustrated a dozen books for Canadian and European publishers. She has won several important prizes and nominations for her work, among them, four nominations for the Governor General’s Literary Awards (illustration), Canada’s most prestigious annual literary prize and more recently her illustrations for the book « Mon parc » published at Les éditions de l’Isatis have been selected for the prestigious Illustrator’s exhibition at the Bologna children’s Book fair 2014. In 2015 she was one of the recipients of the Purple Island Award at the Nami Island International Picture Book Illustration Contest in South Korea. As a member of the Quebec illustrators’ association, Illustration Québec and RAAV, Gauthier has participated in group exhibitions nationally and internationally. She is also involved in a Quebec Ministry of Culture and Communications’ program called Culture in the School, which was designed to ensure that the cultural dimension is integrated into classroom and school activities, and to promote careers in the arts. She regularly leads art workshops for children at the preschool, elementary and secondary school levels.